Last week I attended an exciting annual event, the media tasting of wines from Appellation St. Helena (ASH), one of fourteen sub-appellations within the Napa Valley Appellation. This year’s tasting was again held in the Rudd Center for Professional Wine Studies on the California campus of the Culinary Institute of America, just north of St. Helena. On its exterior the Rudd Center is a handsome, ancient stone building; inside, thanks to a multi-million-dollar renovation a few years back, it’s a sleek and modern state-of-the-art destination for wine studies. 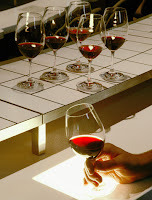 Our event was held in the Tasting Theatre where, beside each seat, is a light box to examine a wine’s color and a small sink for easy wine disposal. People often ask how I can drive home after tasting so many wines, and the answer is simple: I taste but rarely swallow. Like most others sitting in that room, I use the provided spit cup. 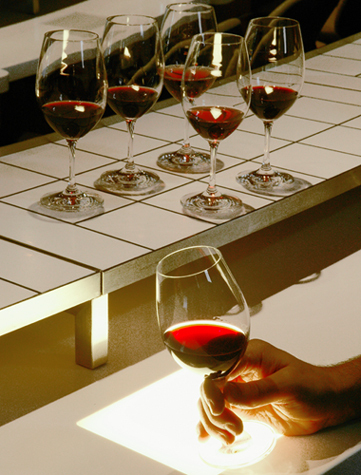 The idea of spit cups makes some people squeamish, but they're simply a practical tool if you're tasting many wines. Once in a great while I like a wine so much that I throw caution to the wind. I probably did that five times in the St. Helena Tasting. To paraphrase Elaine's pronouncement about sponges in an episode of Seinfeld, I consider such wines to be "swallow-worthy." Charles Krug 2007 St. Helena Zinfandel ($25): A mellow Zin (76% Zinfandel, 23% Petite Sirah, 1% Carignane) offering up berries, cherries and a hint of spice. Another of the day's good values. Download Appellation St Helena Overview, a free PDF written by ASH President and Vineyard 29 owner Chuck McMinn.